Skeuomorph. It’s one of those words you have to look up several times before you can remember it. For those unfamiliar with the term, Wikipedia defines it nicely: “a derivative object that retains ornamental design cues to a structure that was necessary in the original.” Some of the examples the entry cites are helpful: fake stitching on a plastic product once made of leather, spokes in an automobile hubcap, or, one of my own bugbears, tiny, useless handles on small maple syrup jugs. Why should publishers care about skeuomorphs? Because as they shift themselves and their products into the digital age, one of the most important questions they must ask is whether to evoke the functionality of the old forms of their output or leap wholly into the new ones. There isn’t a single right answer. But if they don’t ask the question, they will probably get it wrong. Usually, each page contains a month, but there’s no reason for a virtual calendar to be limited in the same way. When dealing with events that span months, it’s much more convenient to view time as a continuous stream of weeks or days. For traditional, analog publishers, the most immediate application of skeuomorphism is to the process of going digital. As I noted last week, one challenge for companies like Ziff Davis Enterprise in going digital-only is whether they should retain the old functional metaphors of print—the page turns, the layouts, the display ads—or drop them in favor of inherently digital functionality. But even for natively digital publishers, functionality will evolve, perhaps more rapidly than ever. As new ways of delivering and presenting content arise, will they look backwards and mask the new with the familiar veneer of the old? Or will they look resolutely forward and ask readers to adjust to the new in order to gain its full benefits? The point here is not that skeuomorphism is inherently bad. It can be a useful and even compelling way to help people understand new functionalities. But in going digital, you need to consider the difference between when looking backwards is really helpful and when it’s just a sentimental gesture. So on your next digital product design, don’t just think different—think skeuomorph. Can You Have Entrepreneurial Journalism without Entrepreneurs? This entry was posted in Design, New-Media Models, The Future of Print and tagged design, digital magazines, digital-only, new media, old-media, print, skeuomorph, Ziff Davis Enterprise by John Bethune. Bookmark the permalink. Great illustration (the iCal pic), wonderful maple syrup example. But I don’t agree with Siracusa. I need to be able to move through digital calendars month by month. Perhaps it could be a setting: move continuously or move month by month. Like the options we get when viewing a document: one page at a time or continuous scrolling through the whole thing, sort of. Whatever his personal preference, I don’t take Siracusa’s point to be that the monthly format isn’t a logical or useful one. 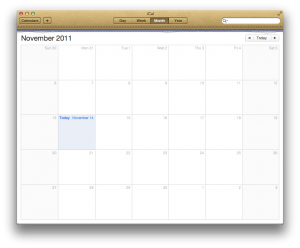 Rather, it’s that Apple’s choice to mimic a paper calendar creates an artificial constraint. Because of it, iCal doesn’t take full advantage of the digital medium. For most people, the monthly option is ideal. But if your business runs in 6-week or 17-day cycles, for instance, wouldn’t it be a useful option to view a cycle on one screen? Here’ s the same point with respect to a publication: Going digital doesn’t mean there’s no place for the kind of bylined, narrative article that is the core of so many print publications. But you would be limiting yourself and your readers if you used a throwback format that didn’t also lend itself to, say, an interactive data presentation.